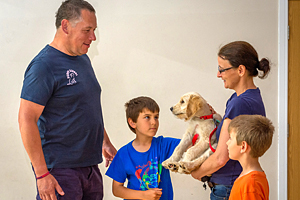 There are several steps to becoming a Puppy School tutor but we believe that by taking time and gaining experience along the way, our tutors develop all the skills necessary to become excellent puppy (and people) trainers. Once an applicant has submitted an online application to us, the Regional Manager for the relevant area will get in contact to discuss the application in further detail and to arrange an informal phone interview. They will then guide the applicant through the remainder of the application process accordingly. New Puppy School tutors receive extensive training in order to qualify and be able to run puppy classes. Our training comprises of nine days: Three days of practical and six days of theory covering a range of topics from animal learning and puppy behaviour to dealing with the media and even managing people. All aspects of running a small business are covered, allowing new tutors to feel confident about progressing with their own Puppy School classes. "The initial Puppy School tutors training course is great fun and you learn loads. It is such good value too. Puppy School has changed my life, I absolutely adore what I do and have a lovely network of other dog trainers on hand to ask advice from. I will be forever grateful to Puppy School." Penaran Higgs, Puppy School North London. The correspondence course is a series of questions, the answers to which must be completed successfully and submitted by the tutor prior to them running their first Puppy School classes. The questions require the tutor to carry out a number of practical training and observational activities with dogs (rescue dogs, puppies, their own dog) as well as training a new behaviour to another species – in the past, we have had tutors training pigs, chickens, cats, sheep and even alpacas! 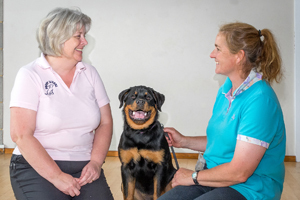 The correspondence course is a great opportunity to further develop a range of training skills, ensuring that the tutor has first-hand experience of a range of different breeds, ages and personalities of dog prior to them running classes for themselves. Once the correspondence course has been successfully completed, the only hurdle left is for the tutor to find a suitable venue, advertise their classes and secure some clients and puppies. Full support and training is provided throughout the tutor training course and also once the tutor is ready to run classes. Throughout the process of setting up and running classes, all tutors are supported by a highly experienced Regional Manager who will be available as their first point of contact for any queries or concerns. Regional Managers visit tutor classes every six months, allowing them to help tutors fine tune and improve their classes.